Here’s a photo I took last spring, just at start of the season Alaskans call “breakup”. This photo is taken from the roadside overlook just south of Glennallen, at Simpson Hill. Simpson Hill is rapidly disappearing, as the Copper River (in the foreground) erodes and cuts away at its base. Soon enough the spot may be known as “Simpson Mound”. This is probably one of the very few (maybe 2) iconic viewspots for Wrangell – St. Elias National Park, the largest (and way coolest) National Park in the US. There are certainly many other grand views to be had, and amazing sites, but few that are so frequently photographed from. The mountains, viewed from this spot, are simply awesome. From left to right, the mountains are Mt. Sanford, Mt. Drum, Mt Zanetti and Mt. Wrangell. Mt. Sanford is the highest of the 4, at 16 237′ tall. Next up is Mt. Wrangell, the broad round massif on the far right, at 14 136. Mt. Zanetti, the little “ski jump” looking cone that springs off Mt Wrangell, is 13 009′ tall, and Mt. Drum, front and center, is just over 12 thousand feet, at 12 010′ high. Those are some grand mountains. Most of the boreal forest in the foreground is white spruce, though there’s a cool band of aspen or poplar in the middle of the frame that can add a vibrant yellow to this scene in the fall. The mighty Copper River, defines the border of the National Park, running south to delta where it runs into Prince William Sound near Cordova. It’s fascinating to see how the river changes throughout the year, raging a turbulent, roaring silt-laden brown in early and mid-summer, clearing up through late fall as it’s volume decreases to a crystalline turquoise, to a frozen, ice-covered mystery in the winter. It’s a magnificent viewpoint, and it’ll be interesting to see how it changes in the coming years, with the Copper River eating away so readily every summer. I was there last weekend, again, and noticed it’s even eroded further back than it was in the spring. Note to visitors: If you DO perchance go to Simpson Hill to get this perspective on Wrangell St. Elias National Park and the Wrangell Mountains, I’d recommend parking in the paved parking lot, and walking the 100 yards or so back over to the edge .. driving over the little gravel road/trail to the edge can easily get you bogged and stuck, as the soil there is way muddy, and your tires can readily sink into it’s greasy depths. Not that this ever happened to me, of course .. 🙂 … but it can happen . so be careful up there. And hope you get some nice light. It’s a great vantage point in the evening. 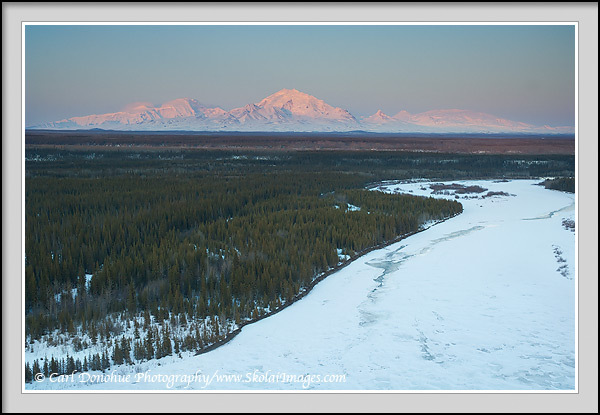 This entry was posted in Alaska, Forests, Landscapes, Travel, Wrangell - St. Elias National Park and tagged Copper River, Landscapes, Mountains, Mt Drum, Mt Sanford, Mt Wrangell, Mt Zanetti, scenics, Simpson Hill, Sunsets & Sunrises, Winter, Wrangell St. Elias on October 18, 2009 by Carl D.
I really do offer my best to my readers. As you know I spent the night on top of Simpson Hill last spring. While there, an older native fellow stopped by and began telling stories of putting the road in along there. He almost went over the edge in a cat! That area has really changed in the last 30 years – they are going to have to move the road. That’s cool – do you know who it was? Imagine going off that cliff in a cat! I agree, the road needs moving. I hope you don’t ding me for asking this question here, how’s your book project about Wrangell-St. Elias coming along :~)..And whenever (if not already) its published can readers/followers of your journal request signed copies ;~)? ?